Make a unique custom cup using our simple online design software. Create your own cup, ideal for coffee or tea, with these photo cups that come complete with a white saucer. Start your day right with a drink from your personalized cup or custom coffee cup. Buy 1, get 1 free. Customized cups are quick and easy to design in our tool and you can even make a photo collage cup too. Create personalized coffee cups with photo to enjoy with your daily coffee. Design your own cups with a coffee drinker in mind to make a terrific coffee cup gift. Just the right size so as not to overdo the coffee volume, between espresso cup and a classic mug. If you know a couple who enjoy their coffee you can design your own coffee cups to get a pair of personalized coffee cups for the price of 1 as they are on buy 1 add 1 free. Design coffee cup for friends and relatives quickly in our easy to use design tool. Customized cups made fast and with generous quantity discounts too. See your custom coffee cups in a few days. You will love their glossy look, balanced feel and handy size custom printed coffee cups that come with a saucer included (unprinted) too. This espresso mug and saucer came out very well. My husband really enjoys his morning coffee. It will be the best gift ever for my friend. Had No problem with the web site , the order was extremely fast and boxed up very well , the whole experience was very pleasant . it is so Much better than I thought it would be, I am very Happy with it . Thanks ! Who Would Love Their Own Personalized Tea Cups? The photo cup with saucer is an ideal gift for tea lovers who want a little luxury in their lives. If you know a few ladies who love to lunch, give them the personalized photo teacup so they can lunch or brunch in style at home. Mr and Mrs cups make lovely wedding gifts for newly married couples, and they double as a sentimental keepsake too. Like many of our products, the personalized cups and saucers come with a quantity discount – ideal for families or group gifts. Buy more than 1 photo cup today and save money. Your beautiful personalized teacups with saucers are lovingly made to order. We use a specialist printing process to print your photos on cups, so your images last for years and years. We make and inspect everything by hand to give you a truly remarkable gift. Your photos or design wrap around the body of the mug, covering the full height and meeting close to the handle at the back. The white ceramic reflects the light giving a subtle gloss finish. The plain saucer included is unprinted, keeping the star of the show the customized teacup. If you’re choosing a small single photo of a face, you may want to position it at the front instead of stretching it to wrap the whole way around, ruining the quality. We suggest a photo that is landscape in nature works best, as you can guarantee your whole mug will feature your photo. If you want to make a bold statement on your photo cup, customize it with a photo collage of all your favorite snaps. For a teacup and saucer worthy of high tea, choose floral or vintage images to get that traditional effect. Your photo cup will look picture perfect next to a yummy scone or biscuit. Create a beautiful memento from your big day by printing your favorite wedding photo onto this stylish cup. We always talk about color, but why not choose a black and white filter to give your customized teacup an artistic look and feel? Your wedding dress will really pop and create a stunning effect. Photo collages are real showstoppers. 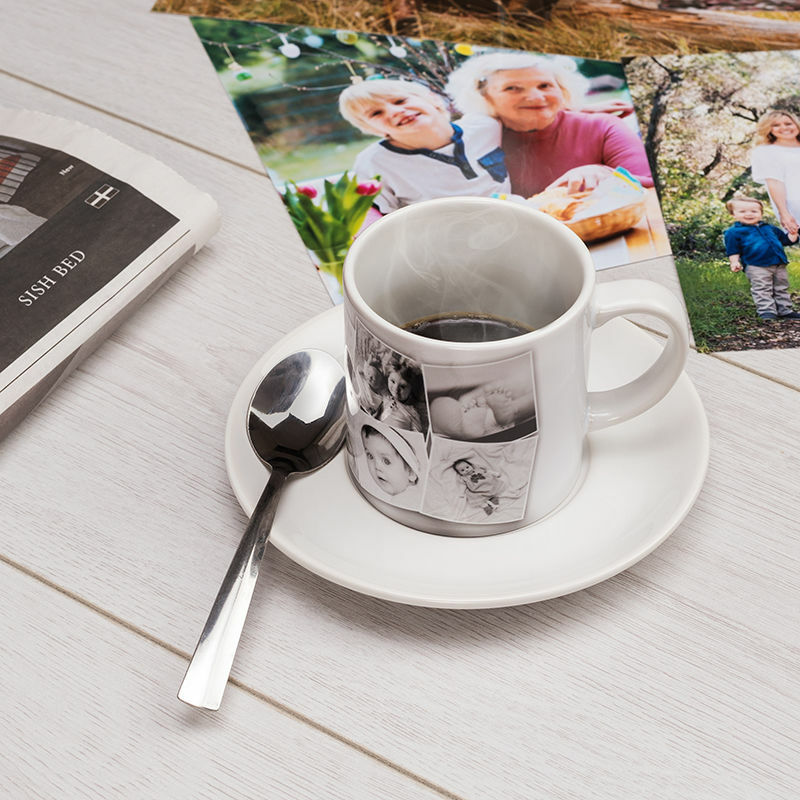 Give your other half a personalized cup and saucer featuring the best snaps from your honeymoon, or spoil grandma with a customized teacup showing photos of all the grandchildren.